...to Ireland of course! And if you do, you could do worse than follow in B. W. Fursman's footsteps to some palmy places. Fab! Now thats what I call a Cordyline...Mature specimen at Timoleague. In the words of the Caribbean song, Ireland may well have been an 'island in the sun', especially after the long, hot summer of this year. However, does the Emerald Isle have more in common with the Caribbean than just a shared history of slavery, immigration, a love of music, brightly painted houses and an equal claim on the parentage of Bob Marley? In other words, does the 'island' of Ireland have palms? My roots, perhaps like the palms', are Irish. On previous visits, I had been intrigued by the crimson hedge-rows of South American Fuchsia magellanica and the banks of vivid orange, tubular flowered, African Crocosmiiflora - better known as Montbretia. Not to mention the numerous spiky 'palm-trees' I thought I had seen outside pubs, banks and the occasional Garda (police) station. The folk ballad, 'Give Us Back Our Teddy's Head', compares the shape of Ireland to a small bear. Therefore the hind-legs - counties Cork and Kerry - stick out and 'paddle' in the equatorial currents of the Mexican Gulf Stream This gives Ireland an important advantage over other parts of Northern Europe - an almost total absence of severe frosts and snow. Winter temperatures averaging 5 to 7¾C (40 to 42¾F) and in summer, 15 to 17¾C. (60 to 65¾F) Allowing for this summer's exceptional sunshine, a normal, Irish 'hot' day goes up to 25¾C (80¾F). Despite this, the familiar expression 'The Emerald Isle', was penned by the dry-wit, William Drennan, for a very good reason - rain! Thankfully, Irish rain like the whiskey, is softer, more aromatic and has less 'bite' than the Scottish variety. Often a talcum powder of mist sprinkled over the land the rain, unlike the whiskey, rarely turns into a hard downpour! Consequently, "It's a soft day today," is a euphemism often heard leaving the lips of smiling Irish landladies. Describing as it does, the rain-sodden landscape awaiting the unsuspecting tourist beyond the steamy window of the B & B. To compensate, Ireland, even this summer was lush and green compared to mainland Britain; a land which bore a striking resemblance to the Kalahari Desert during an exceptional drought. To quote Fodor's 'positive thinking' guide to Ireland, 'The rain brings the flowers there are tropical islands or equatorial jungles where flowers grow in more splendid profusion and variety.... but I disbelieve it'. The mild climate, rainfall and fertile soil, make it reasonable to ask whether conditions are conducive to cultivating some species of exotic plants that would not normally survive in more frost-prone parts of Europe. It was even rumoured that whole forests of Dicksonia antarctica thrived in the damp, mild climate of southern Kerry. To visit Ireland again was the only way to find out if this was true. Furthermore, what better time to palm-hunt in Ireland than during the hottest summer the country was experiencing since records began. I had packed a couple of very useful publications before starting out. One was entitled 'Gardens of Ireland'. The other, 'Leisure Map - Ireland', showed the location of 'subtropical gardens'. I also took along an umbrella, a good singing voice and a sturdy pair of walking shoes - I would recommend them to anyone planning a 'palm safari' in the Emerald Isle. My own quest for the exotic started with the prosaic - the boat from Fishguard in Wales to Rosslare, County Wexford, supposedly Ireland's 'Riviera' and also its driest region - weather-wise that is! Stepping out of the ferry terminal at Rosslare, the visitor is immediately confronted by the ubiquitous Cordyline australis - the plant I innocently mistook for a 'palm' on previous visits. The Stars and Stripes, the Republic's green, white and gold tri-colour and the blue EEC flag are to be found everywhere in Ireland. 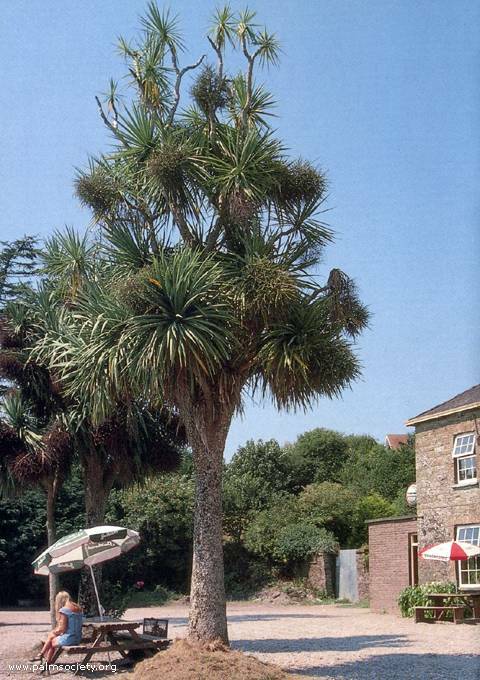 Likewise, Cordylines in bizarre shapes and sizes, rustle in the breeze outside nearly every pub, hotel and shebeen. Rosslare, the resort-town not the ferryport, is easily missed by many visitors. Besides having an unspoilt, six mile beach, it was there I encountered my first, 'Celtic' Chusan Palm Trachycarpus fortunei, toasting hardy fronds beneath the merciless Wexford sun. Outside an hotel I also discovered four Agave americana variegata. With the ever present Cabbage palms - Cordyline Australis - in both the gardens and roads of the small resort, the effect, if not the botanic classification, was truly exotic. Leaving Rosslare, I travelled directly south, following the road that leads to the Ballyhack Passage East car-ferry. This crosses the Waterford harbour estuary and is the easiest way of shortening the journey, which otherwise has to be made by road further west. Passing through Waterford (of crystal glass fame), my destination was Fota, nine miles east of Cork city. Fota was an island now joined by bridge to the mainland. It contains a Wildlife Park and an arboretum with a world-famous collection of trees and shrubs. Before reaching Fota, I stayed overnight in the harbour town of Dungarvan. There, I discovered the owner of my overnight accommodation (Cairbre House, Tel: 058 42338), had lived for years in Kuwait. He was now interested in growing sub-tropical plants in the large garden that stretches down to the waterfront. As evidence, a Fatsia japonica sat in the entrance hall and two cacti - in containers - basked in the mellow afternoon sun at the front of the ivy-clad, two hundred year old building. Next morning, I drove to Fota along the N25. This is the best way to approach the aboretum, as it avoids Cork City one-way system. There is no doubt in my mind that this was specifically designed to test the patience of saints - of which Ireland has many. At Fota I may as well have been lost in Cork for all the time I wasted in trying to locate the aboretum. Do not make my mistake and pay the hefty entrance fee to the Wildlife Park, perhaps enticed inside by the sight of two healthy Phoenix canariensis, the Canary Island Date Palm, in large pots, by the turnstiles. If you do, you will spend a frustrating hour trudging between giraffe, zebra and pink flamingos and even pinker parents accompanied by bawling, overheated children, hoping to spot a Musa basjoo, Chamaerops or even a trusty old Trachycarpus fortunei. Take my advice - there ain't none - turn around for Dicksonias or Washingtonias! The Arboretum is on the other side of the car park, absolutely free to enter and wonderfully deserted on the mid-August day I visited. Comprising 780 acres of mild and sheltered microclimate, it includes a Fernery, Orangery, Water and Walled Italian Garden and even a small temple. The Arboretum was planted in earnest in the 1840's and with Fota House formed part of a Regency estate. It is also home to plants from all over the world - species from China and South America proliferating and growing to great heights in the benign climate. Today, this microclimate has resulted in whole avenues of mature, 'mop-topped' Trachycarpus lining the paths. An added bonus at Fota is that each plant is labelled giving its country of origin, planting date and height in 1966 and 1984. In the Fernery, I encountered my first grove of rather parched looking, Dicksonia antarctica tree ferns. It was hot, and their dry condition reminded me of the thirsty punters described in the song, 'The Pub With No Beer'. Leaving the Fernery, I came upon the spectacular sight of two fully mature Phoenix canariensis, Canary Island Date Palms. These be-whiskered, old gentlemen - relics from a colonial age - stood eternal sentry duty each side of the dilapidated summer-pavilion'. However, on reading the labels, I found the Date Palms were only planted in 1966. Then they stood 5.5m tall to the crown centre. When measured in 1984, they reached the height of 8m. Today, their lofty fronds would do justice to 'County Cairo' let alone County Cork! Nearby, clustered two extremely large, bushy clumps of the hardy Chamaerops humilis the Mediterranean Fan Palm. Away from the old pavilion, I also spotted the luminous, billowing green paddles of the root-hardy Musa basjoo. It was tucked snugly up against a protective, stonewall and was my first sighting of an 'Irish banana. Optimism, like good humour, friendly people and rain is never in short supply in Ireland, and I was therefore not surprised to spot an adolescent Cotton Palm - Washingtonia filifera, planted near the Musas. Following the path leading to the walled Italian Garden, I passed yet another of the many Trachycarpus that had been planted in 1916 - ironically, the year of the Easter Uprising. 'Bayonets' were also in mind on next encountering the sharp shoots of the Spanish Bayonet, Yucca aloifolia. In the Italian Garden, I rested from the uncompromising, mid-afternoon heat. On the lawn in front of me, stood the statuesque bush-shapes of some of the most mature Cordyline australis I had ever encountered in northern Europe. Behind, some more Musa basjoos - while to my left, over the old, stone wall, waved the feathery fronds of the Canary Island Date Palms - as if transported from an Arabian souk. Open daily from 1st April until 30th October - 10.00 a.m. to 5 p.m. and Sundays at 11.00 a.m., a visit to Fota Island Arboretum should be an absolutely essential item on any palm enthusiast's itinerary. With regret, I left Fota behind and pointed the car further southwards - towards Kinsale the other side of Cork City. Kinsale is noted as the 'gastronomic capital of Ireland' as well as having historic links with France and Spain. Although a real treat for the taste buds - if not those of a botanical nature - I was soon on the road to Timoleague Castle Gardens in Timoleague, County Cork. Situated eleven miles south west of Kinsale, these are open to the public 'most days' - as they say in Ireland however phone (023) 46116 just to check. Like Fota beforehand, I found the entrance to the gardens difficult to locate - no wonder - it was late Sunday and the sign had been taken in as the gardens were closed for the evening. At least by the time I went back on Monday, my geographical knowledge of the local countryside had certainly improved! At the entrance to Timoleague, the lucky visitor encounters an almost luminescent stretch of lawn leading up to the 'new' house, built alongside the thirteenth century Barry Castle. 'The Lawn' as it is referred to, was reclaimed from the sea and laid out in the 1870s when it provided courts for the first Lawn Tennis Club of Ireland. At this end of the lawn is the shrubbery, created on the site of the old Timoleague House, burnt down in 1920 during the 'Troubles'. Some interesting plants are to be found here such as spring flowering azaleas and magnolias as well as nearby, my first 'spiky' of the day - a Spanish Bayonet, Yucca aloifolia. Also worth noting was a mature example of a plant that had greatly impressed me at Wisley with its exotic foliage the jungle-like, Paulownia tomentosa or Foxglove Tree. Walking up towards the Castle from 'The Lawn', the path leads towards the sunken Valley Garden. This once formed part of the castle moat defences. Nowadays, its formal beds and lily pond are dominated by four fully mature Cordyline australis - their massive, fragrant, creamy-white panicles flowering in early June. The garden has a tranquillity, and yet a gentle vibrancy that reminded me of Monet's garden at Gierverny, outside of Paris, that is - 'sans les touristes'! From the Valley to the Lower Garden is a short walk up steps overhung by a fine lime-arch and guarded by pots of razor-edged, Agave americana variegata. At the far end of the Lower Garden, there is a long range of greenhouses. These were once heated in three sections at different temperatures for growing exotic plants. The greenhouses have recently been renovated but, according to the guide, 'have long since ceased to house the more exotic specimens'. I did, however, notice (and taste!) the first black grapes I had seen growing in Ireland. Potted Musas, Agaves, Phormiums and Cordylines are also grown for sale in the Lower Garden. Leaving the greenhouses, I made my way towards the River Garden and orchard being developed on the banks of the Argued River. This tranquil walk is partly on the track of the former Timoleague and Courtmacsherry Light Railway. In the orchard, I was pleased to note two young yet sturdy examples of Trachycarpus fortunei amongst the old apple trees. Timoleague is a place that permeates the thoughts. Maybe it was the heat haze or the effects of the afternoon 'pint-of-plain' but I think I saw my first glint of the giant, 'potted-palm-of-gold' beneath the rainbows created by the lawn sprinklers on that historic lawn. After visiting the gardens, I recommend Lettercollum House (0230 46251) as a relaxing stop-over in Timoleague The old nunnery, now hotel and haute cuisine restaurant, also has some attractive, southern European 'Irish Strawberry Trees', Arbutus unedo. I stayed at Lettercollum before venturing on to Creagh - more Trachycarpus and many more Dicksonias - and the next stop on my tour of Irish, sub-tropical gardens.